Armed with arguably the sport's most fearsome serve, Pete Sampras earned 14 career Grand Slam titles. His last major win came against longtime rival Andre Agassi at the 2002 US Open, Sampras' final slam. Though "Pistol Pete" maintained a healthy distance from the public eye during his playing days, he's giving fans a virtual reality experience, walking through the player locker room as part of the American Express Pro Walk at the USTA Billie Jean King National Tennis Center. 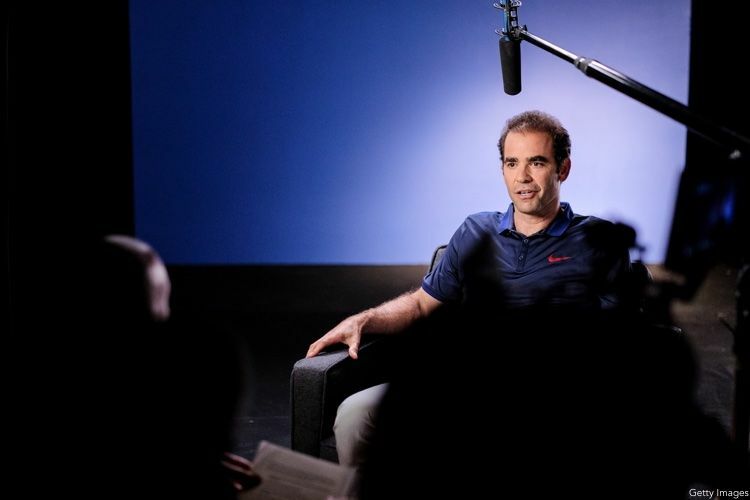 Before this year's U.S. Open opened play, ThePostGame caught up with Sampras about today's young tennis stars, his post-retirement life and a potential reason he never won the French Open. ThePostGame: What was it like to walk through the tunnel at Arthur Ashe Stadium? PETE SAMPRAS: You walk down that tunnel and you stop, and the camera's on you, and they put you on the big screen up on the court itself, and the crowd sees you, and you're just sort of like, "Okay, it's showtime." It's the biggest stadium we have in the sport. I felt like I was pretty excited, I was jacked up. This is it, you know? This is why we play. This is not just another event. This is Arthur Ashe Stadium. TPG: It's been 14 years since you last played. Are you able to just sit on your couch and enjoy the U.S. Open as a fan? SAMPRAS: There were maybe a few years there where I was sort of like, "Ah, I really miss it," or "I can still play." But now being retired 14 years, I'm happy to sit on the couch and watch with my kids. You miss the emotions, you miss the crowd, you miss the moments. But I don't miss the stress. I don't miss the expectations I put on myself. TPG: Were you able to find a replacement for the feelings you experienced on the tour? SAMPRAS: I don't think you could ever replace that -- the excitement when you walk out on that court. There's nothing else in life that can even come close to that. You win your [opening match], you wake up in the morning, you read all the papers. And you're just on a high for a couple weeks there. Nothing can really compare [to it] in my life today. You play some golf, you have some fun, but nothing can ever compare to what it's like to step out on the court. The first few years after [retirement], you miss it, and you see the guys you competed against winning majors. But now I'm so far removed from it. There are so many new players that I just don't have the attachment anymore. So I've moved on. TPG: Speaking of new players, World No. 6 Milos Raonic says you inspired him growing up. How does it feel to know you've had such an impact on a top player? SAMPRAS: Flattered and old [laughs]. He modeled his game and his serve after me, and I think for me, it's flattering that someone looked up to me. And to actually see him doing well -- he made a big step this year at Wimbledon beating Roger [Federer in the semifinal], just mentally getting through that. And I know at the U.S. Open, there's no reason why he can't get to the semifinal or final. I'm just a fan of his game, a fan of him. He's got a good attitude and works hard. He's got John McEnroe helping him out, I think that was a good decision. TPG: I know you looked up to Rod Laver. Were there other players you looked up to? SAMPRAS: Laver was a classy guy. [He] won on all the surfaces. I got to know him quite well. He's a humble champion, I've always liked that. I was also a fan of Bjorn Borg. I think Borg stood out to me because he was so cool and collected. That met my personality more than, say, [John] McEnroe or [Jimmy] Connors, who were more expressive. But I was still a fan of all these people I looked up to. TPG: Speaking of McEnroe, a lot of former tennis greats are coaching at the professional level right now. Is that something you may consider in the future? SAMPRAS: I really don't. The traveling, being on the road for a few weeks here and there, that's not something that interests me. I'm not opposed to working with someone maybe locally here in Los Angeles. If they want to spend some time here, we can hit a few balls and talk. But to go on the road, and especially coach, is not something I'm interested in at the moment and probably forever. I just don't see myself doing that. TPG: Have your two sons, [Christian and Ryan,] ages 11 and 13, shown interest in tennis? SAMPRAS: They were doing a tennis camp this summer and I'm not sure it's for them. My younger one plays a little bit more than my older one. We hit a few balls here at the house and I try to help them out, [but they] don't listen to me [laughs]. What else is new? I'm not going to push them to play tennis. If they want to play, great. If not, I'm okay with that. Just as long as they love what they do and they're good kids and they're good students, that's all I really care about at the moment. TPG: Your final tournament was the 2002 U.S. Open but you technically didn't retire until about a full year later. In your heart, when did you actually know you were done playing? SAMPRAS: Well, I wanted to see how I felt over the next couple months [after the 2002 US Open]. I pulled out of the Australian Open, I pulled out of the French Open. I just felt, "Maybe I'll play Wimbledon." [But] once Wimbledon was coming up, I felt like I had nothing left to prove to myself. I've done it all. I felt, emotionally, I was done. Once Wimbledon was on the TV and I didn't want to be there, that's when I knew I should stop. So that was the moment. It was time to call it a career. It took me up to a few months to get there. I don’t regret [retiring] at all. Physically, I could've kept playing. I left my sport on my terms and left on top. TPG: You retired in your early 30s, which seems pretty early compared to players in today's game. SAMPRAS: The game's gotten more physical and it's harder for teenagers to win majors. Maybe the body doesn't develop until they're 22, 23. TPG: Do you think that if today's hi-tech equipment like racquets and strings had come a couple years sooner, you would've won the French Open? SAMPRAS: Some people did mention to me about trying new technology for the French, trying a bigger racquet, trying a different string. But I was so against changing anything. I look back at it now and I had a very difficult racquet to play with at the French. To not use technology to my advantage – I do regret that a little bit. Being a little bit more open-minded would've made things a lot easier for me. It would've helped me play a little better on clay. And it was just coming out when I was leaving, these strings and these racquets. I'm using [them] now and I tell you, it makes life a lot easier. I wish in my prime, I would've just experimented a little bit. But, unfortunately, I was in a different headspace. It just wasn't meant to be. TPG: You had the most Grand Slams titles in history when you retired. But now Roger Federer, Rafael Nadal and Novak Djokovic may all eclipse that. Does that bother you at all? SAMPRAS: No. I did all I could do in my time. I was the player of my generation, I won 14 majors, and that's all I could ask from myself. Sure, I would love my 14 to last forever. But like the cliché: Records are meant to be broken. If you would've told me one guy would be tied, one broken and one close to tying, I would've said, "You're nuts! There's no way that's ever going to happen!" But here we are today. I look at my career and look at the time I had and whom I competed against. I was the player for the majority of my career. That's all I could ask for myself.